Do you like zombies? Duh! You like kill them, no doubt! Zombies are everywhere. So just take the weapon and murder them at any rate! Beware of some things that could kill you. Collect all points and improve your gun! 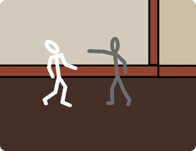 Use your left mouse click to aim and kill all the zombies! Collect coins to gain upgrades.